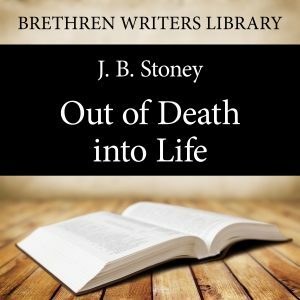 As JB Stoney explores the experiences of Jonah and others in ‘Out of Death into Life’, he shows us that “WILL is the real cause of the restlessness, and of the absence of full joy in souls. …. the only true place of happiness for a believer is to be without a will of his own….” and how the enjoyment of our salvation depends on us appropriating the death of Christ. What did Eve, Jonah, the Rich Young Ruler and many, many others in scripture have in common? They had a will of their own that was against God; God wanted them to go to the left and they wanted to go to the right. A word about the author: James Butler Stoney (1814 – 1897) was born in Co. Tipperary, Ireland and entered Trinity College, Dublin, at the young age of fifteen. In 1831 men were dying of cholera all around him in Dublin. He was suddenly taken ill and, sure he was going to die and realizing he was a sinner on the very brink of a lost eternity, he called upon the Lord Jesus Christ alone for Salvation and was gloriously saved. He left off studying for law and joined the Divinity Class at Trinity College, Dublin, hoping to study for four years and then be ordained. His family were very angry, as they thought his fine talents and opportunities were being thrown away. But during those four years he was studying the Scrip­tures with all the earnestness of a soul that had learned that unseen things are for eternity, and the seen things of this life are passing away. He never was ordained, and became part of an early ‘Brethren’ Assembly, ‘gathered to the Lord’s Name’. He has written a book called "Discipline in the School of God," dealing with the Old Testament characters, and contributed to several periodicals including ‘A voice to the Faithful’. A fervent, impressive speaker, he spoke somewhere every day and travelled much around Great Britain and Ireland, teaching and preaching.